Although this work is not in the Stirling Smith collections, the Burgh Architect’s personal record of it is. The photograph shows part of the great mural by Charles Anderson on the frontage of Stirling Swimming Pool, which opened in 1975 in Goosecroft Road. The architect was Alexander Jamieson Smith who also designed New Viewforth. Both the pool and New Viewforth were also demolished around the same time, in 2014. Fortunately, the mural was rescued by the original builders, the Ogilvie Group. The work can be seen to great advantage, floodlit at night, beside Ogilvie’s premises on the Glasgow Road. The rescue and relocation of this work is important, as Charles Anderson, who graduated from the Glasgow School of Art in 1959, is a major figure in the history of Scottish architectural art. He spent over thirty-five years as an architectural sculptor and mural designer, pioneering new methods of production, and winning commissions throughout the British Isles. 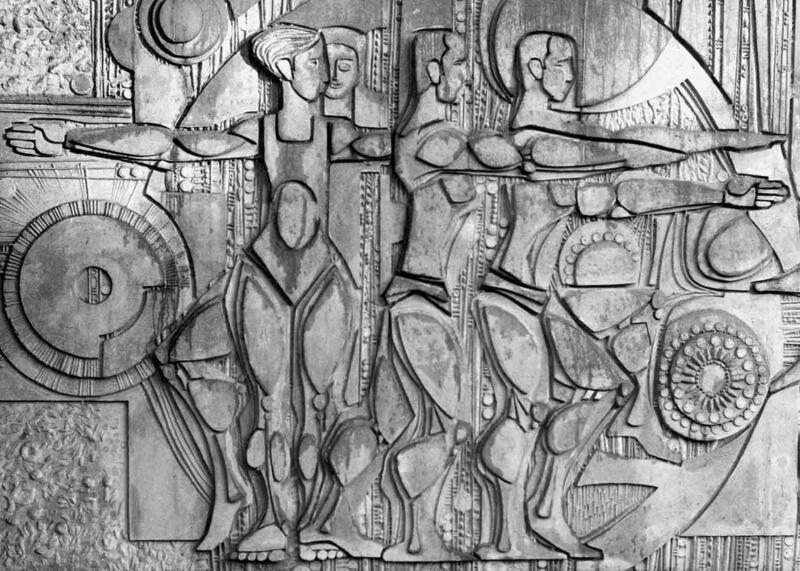 His work for Burnley District Council was probably the longest wall sculpture in the UK – a 9 ft high, 150 ft long sculpture for the Sports Centre. It too was relocated, following the demolition and rebuilding of the facility in 2011. Among Anderson’s work in bronze are the sculptures for Scottish Amicable (1989) and “The Community” sculpture for Livingston New Town in 1996.